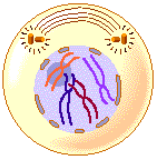 In the Cell Cycle unit you will learn about the function and process of mitosis. Emphasis is placed on key checkpoints of the cell cycle, at which cancer cells behave differently that noncancerous cells. ​The unit is planned to take 3 school days. Cell division is essential but must be controlled. State the function of mitosis. 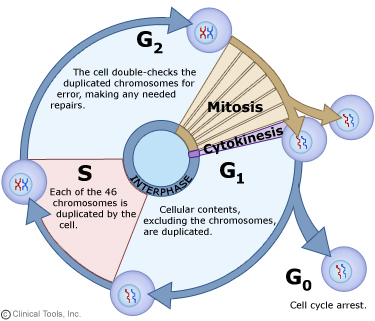 List four processes which involve mitosis. State the names of the four phases of mitosis. Draw typical eukaryotic cells as they would appear during the interphase and the four phases of mitosis. Outline four events that occur during prophase. Outline the process of metaphase, inclusive of the role of microtubules and the kinetochore. Outline the process of anaphase. Outline four events that occur during telophase. 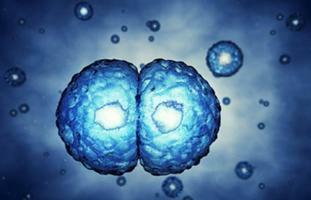 ​What is (and is not) mitosis? G1 Checkpoint: Determines appropriate growth conditions (nutrients, cell size, presence of growth factors, etc.). Assess the level of DNA damage from ionising radiation or UV. G2 Checkpoint: Determines the state of pre-mitotic cell. Suitable size required for successful cell division. Identify replication faults which may have occurred to changes in the DNA sequence distorting genetic fidelity of the daughter cells. Metaphase Checkpoint: Ensures proper spindle assembly and correct attachment to centromeres preventing non-disjunction events. Centrioles begin moving to opposite ends of the cell and fibers extend from the centromeres. 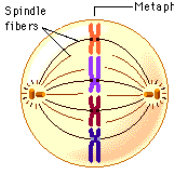 Some fibers cross the cell to form the mitotic spindle. In animal cells, cytokinesis results when a fiber ring composed of a protein called actin around the center of the cell contracts pinching the cell into two daughter cells, each with one nucleus. In plant cells, the rigid wall requires that a cell plate be synthesized between the two daughter cells. Describe the structure of a replicated chromosome, include the centromere and sister chromatids. Explain why chromosomes must condense during mitosis. Chromatins are loosely packed DNA within the nucleus. In this unravelled form, the DNA is accessible to transcriptional machinery and so genetic information can be translated DNA is organised as chromatin in all non-dividing cells and throughout the process of interphase. During mitosis chromosomes (tightly wounded strands of DNA) condense prior to division in a process called supercoiling. In this condensed form, the DNA is able to be easily segregated however is inaccessible to transcriptional machinery. Since a nucleus is generally less than 5 µm in diameter and some of the DNA molecules are over 50,000 µm in length. As the DNA is replicated during the S phase of interphase, the chromosome will initially contain two identical DNA strands. These genetically identical strands are called sister chromatids and are held together by a central region called the centromere. When these chromatids separate during mitosis, they become independent chromosomes, each made of a single DNA strand. ​1.6.U.3 Interphase is a very active phase of the cell cycle with many processes occurring in the nucleus and cytoplasm (Oxford Biology Course Companion page 55). List example metabolic reactions occurring during cell interphase. Outline events of G1, S, G2 and G0 phases of interphase. State the difference between mitosis and cytokinesis.. Contrast cytokinesis in plant and animal cells. Describe the formation of the cleavage furrow in animal cell cytokinesis. Explain the role of cyclin and cyclin-CDK complexes in controlling the cell cycle. The phosphorylated target protein will trigger some specific event within the cell cycle (e.g. centrosome duplication, etc.). After the event has occurred, the cyclin is degraded and the CDK is rendered inactive again. There are 4 main types of cyclin in human cells. Define tumor, benign, malignant, metastasis, cancer, mutagen and carcinogen. Describe why mutagens are not necessarily carcinogens. Describe how cancer arises, referring to accumulation of mutations over time. Tumors are the result of uncontrolled cell division, which can occur in any organ or tissue. Many of these cells can commonly avoid immune detection as they are not foreign bodies but abnormally functioning body cells. These abnormal growths can either be localized (primary tumours), meaning they do not move to other part of your body. These tumours are benign. If the cancer cells detach and move elsewhere into the body (secondary tumours), they are called malignant and are more life-threatening. Diseases due to malignant tumours are known as cancer. In cancer two types of genes are usually affected, oncogenes and tumor suppressor genes. Oncogenes are mutated forms of proto-oncogenes (which typically control synthesis of proteins involved in cell signaling or cell division). These cells with activated oncogenes cause uncontrolled growth and cell division, prevent the cancer cell from dying and allow them to invade other tissues. Tumour cells may either remain in their original location (benign) or spread and invade neighbouring tissue (malignant). 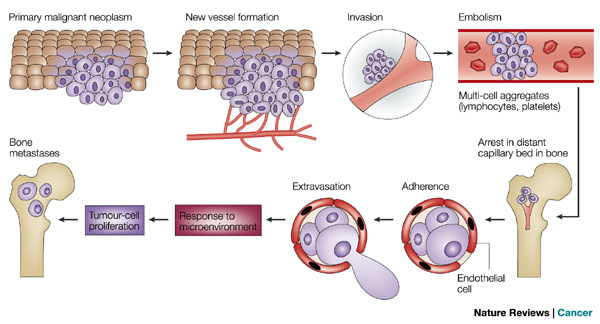 Metastasis is the spread of cancer from one location (primary tumour) to another, forming a secondary tumour. Secondary tumours are made up of the same type of cell as the primary tumour – this affects the type of treatment required. E.g. If breast cancer spread to the liver, the patient has secondary breast cancer of the liver (treat with breast cancer drugs). Explain the use of correlations to determine the relationship between two variables (inclusive of positive and negative correlations). Explain why the existence of a correlation does not necessitate a causal relationship between two variables. Calculate a correlation coefficient using Pearson's R.
Determine if a correlation coefficient value is significant. Define significant as related to the relationship between two variables. 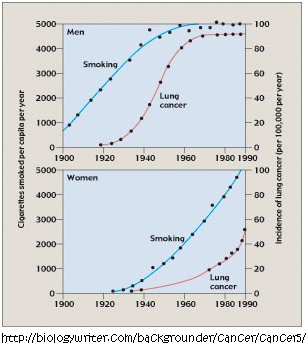 ​What do the graphs indicate regarding the correlation between smoking and lung cancer? There is a positive correlation. However, correlation does not mean causation. Increase in lung cancer is observed in both men and women. An increase in the number of cigarettes smoked per year leads to an increase in the incidence of lung cancer. Avoiding exposure to cigarette smoke reduces the chance of getting cancer. Determine the phase of mitosis of a cell viewed in a micrograph or with a microscope. State the formula for calculation of a mitotic index. Calculate the mitotic index of a tissue as seen in a micrograph. Outline the use of mitotic index calculations in diagnosis and treatment of cancer. 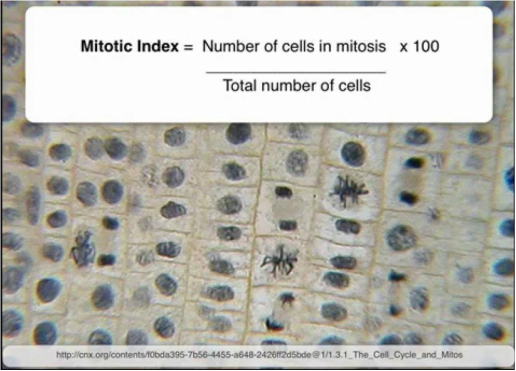 ​The Mitotic index = number of cells containing visible chromosomes (in mitosis) divided by the total number of cells in field of view. Correlation-cause conundrum: Link between contraceptive pill use in women and prostate cancer in men. ​Hank describes mitosis and cytokinesis - the series of processes our cells go through to divide into two identical copies. ​Paul Andersen describes the process of mitosis. He begins by discussing the importance of the cell cycle in development, regeneration, asexual reproduction and wound healing. He differentiates between haploid and diploid cells and describes the structure of the chromosome. He then moves through all the phases of mitosis; interphase, prophase, metaphase, anaphase, telophase and cytokinesis. 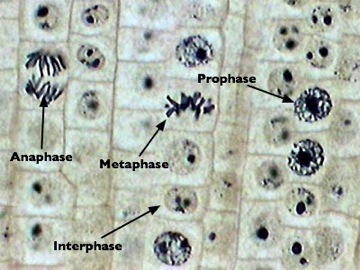 Stages of Mitosis, a promotional piece, begins with a fly-through of cells preparing to undergo mitosis (cell division). ​This video about chemotherapy, created by Nucleus Medical Media, depicts normal cell division, apoptosis, tumor cell formation, tumor development, and angiogenesis of a tumor. It describes the cause of tumor cell formation at the genetic level with DNA, and metastasis through blood and lymph vessels. This animation covers the various effects of chemotherapy: cancer cell death, tumor death, destruction of normal cells and tissue. It also covers the side effects associated with chemotherapy treatments. Also described are related treatments, such as, radiation, pills, capsules, liquids, intravenous injections, surgical procedures, catheterization, CSF injection, wafter placement, and schedule of treatments. David Agus explains, cancer treatments have had a short-sighted focus on the offending individual cells. He suggests a new, cross-disciplinary approach, using atypical drugs, computer modeling and protein analysis to treat and analyze the whole body.